Answer: Thanks for another beautiful photo, Jennifer, and for sharing it here on Sky Lights. Very sharp focus this time, judging from the pinpoint stars and details on the trees. Click on that image to open a larger version in a new tab. Here’s the EXIF data: Canon 60D + Tamron 18-50 mm lens, ISO 1000, f/2.8, t = 20 s.
When I responded to your question back in April, I was focused more on explaining why you were seeing so many aurorae this season, and how the “curtain” structure comes about. As you’ve already discovered, aurorae come in a variety of colors and shapes. I’ll say a little more about that here, now that we have a second example. Readers might want to take a look at that April 6 2015 post before continuing. So let’s explain the color variations first. All the colors you see in aurorae are the result of molecules in our atmosphere being electrically stimulated by charged particles from the Sun. There’s always a stream of charged particles flowing outward from the Sun in all directions. It’s called the solar wind and, as explained in my April 6 post, the strength of that wind varies on an 11-year cycle. We’re currently near the maximum of that cycle. When those charged particles encounter Earth’s magnetic field they’re attracted to the poles, deflected downward, and collide with Earth’s atmosphere. Most of the colors you see are from oxygen and nitrogen, but other trace gases like hydrogen and helium can participate. It really depends on how much energy those charged particles have, and how deep into the atmosphere they penetrate. The mix of gases in our atmosphere varies at different altitudes. And each gas has its own specific spectrum of colors, so as with neon signs, the color you get depends on the mix of gases. The Exploratorium has a great page with the chemical details about aurora colors, including many photographic examples. The variation in aurora shape is a little more difficult to explain. They can be diffuse glows (as in your photo this week), curtain shapes (as in your April 6 photo), streamers, spirals, spokes, or other shapes that don’t even have a name. Take a look at the variety of shapes displayed in this Google Image search. Aurorae are sculpted by the invisible 3D magnetic field that rotates with our planet. Incoming charged particles always follow magnetic field lines and spiral along them, so the direction and energy of the incoming charged particles dynamically determine an aurora’s geometry. 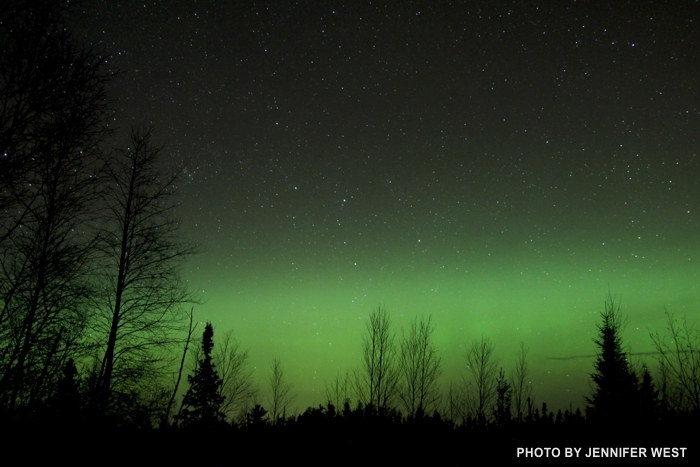 The “curtains” visible in your April 6 photo are streams of these particles higher up in the atmosphere, where collisions with air molecules are less likely, and Earth’s magnetic field dominates the aurora’s shape. The diffuse unstructured glow in this week’s photo is a lower altitude effect, where random collisions with air molecules dominate, hence you see less structure. The green color comes primarily from oxygen, which is more abundant at lower altitudes. So you now have two excellent examples of differing aurora colors and forms. If you’re fortunate enough to capture another unique color or form, please send it my way. Several of my readers said they really enjoyed your first photo.